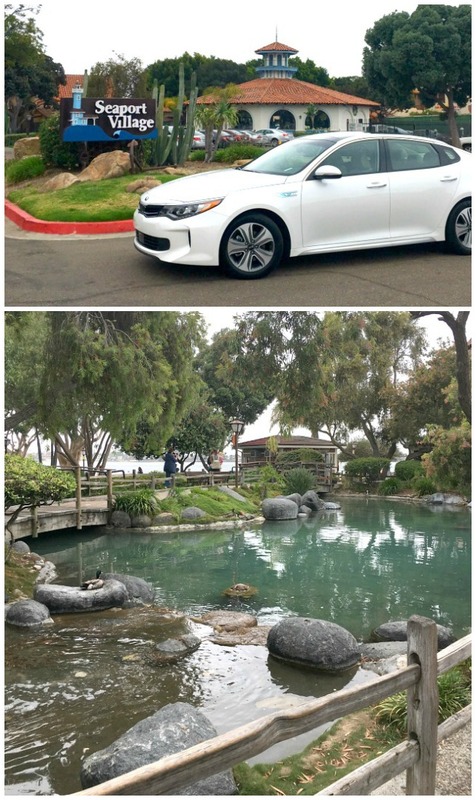 Last week, I spent 2 glorious sleeps in San Diego exploring the city in Kia’s fleet of eco friendly cars. Y’all, 10 years ago Kia was at the bottom. Over the next decade, Kia dedicated itself to quality craftsmanship and in 2016 earned the top spot on JD Power and associates study of best initial quality in the entire car industry… above all of the luxury car brands! That’s pretty dang impressive if you ask me. 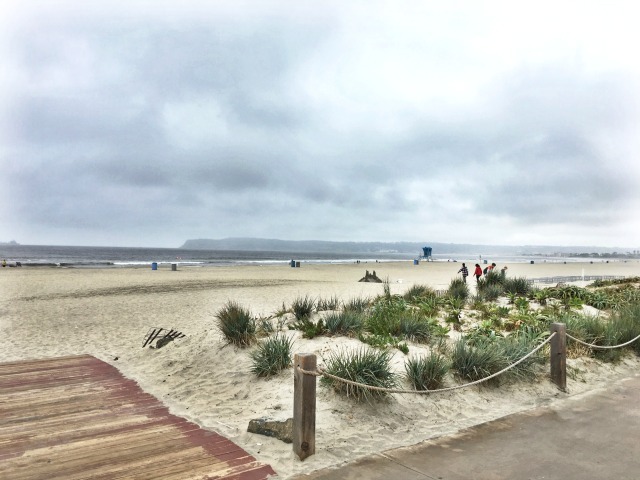 Best beach for kids is Coronado Beach: The waves are small, the beach is wide, and you get to drive across the Coronado Bridge to get there. Bonus: The airport is nearby so airplane spotting is also a highlight for the littles. Best beach for dogs is Ocean Beach: Dogs are allowed off their leash at Ocean Beach. There are no parking fees, restrooms, and picnic tables. Best beach for fishing is Oceanside Pier: The wooden pier is 1,942 feet long and a great place to spot seagulls, pelicans, dolphins, seals, sting rays and fish. There is a shop halfway down the pier that sales fishing supplies. Bev’s favorite beach is South Ponto Beach, Carlsbad: It’s not too crowded, even in summer, and it is perfect for boogie boarding and surfing. It’s also a great spot for catching a sunset. Furry friends are not allowed. 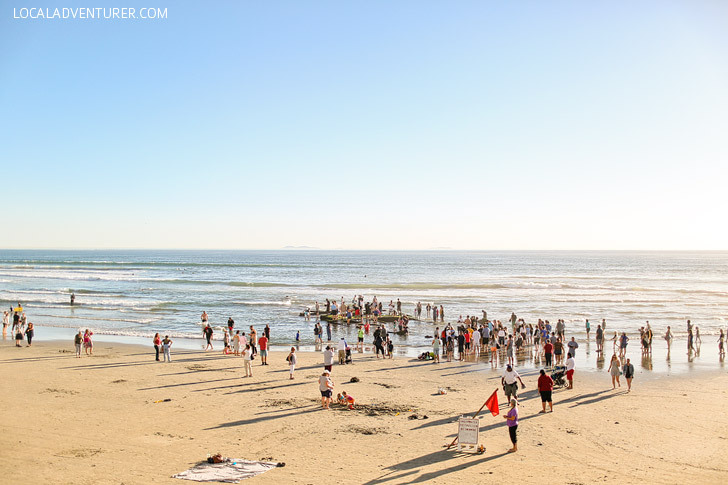 For more information about all of the San Diego beaches, check out this link. I spent 2 nights at the lovely Hard Rock Hotel in the heart of the Gaslamp Quarter and strolled the neighborhood endlessly. This historic San Diego neighborhood is known for its Victorian architecture sprinkled with modern skyscrapers. 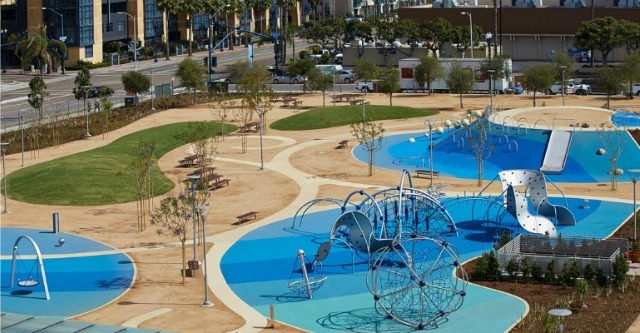 It’s also home to the Children’s Museum, Petco Park, tons of eateries, shopping, and street art. 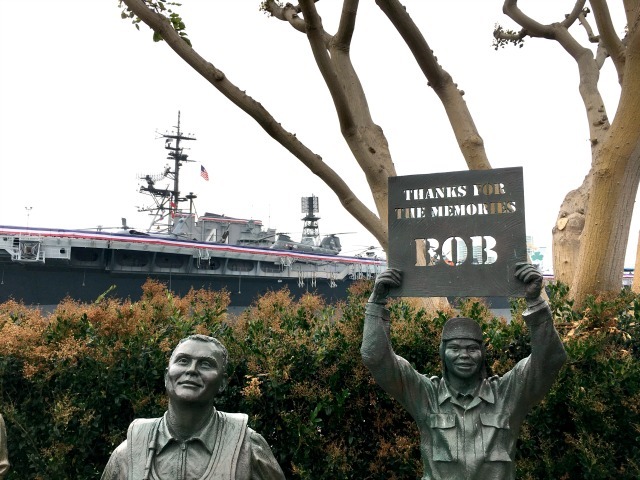 This museum is an actual Navy aircraft carrier complete with 29 restored aircrafts from World War II to Operation desert Storm. Kids can even climb in the cockpit of several aircrafts! Children 5 and under and active-duty military personnel get free admission with a valid ID. The grounds are free to explore and there is a lot to see! 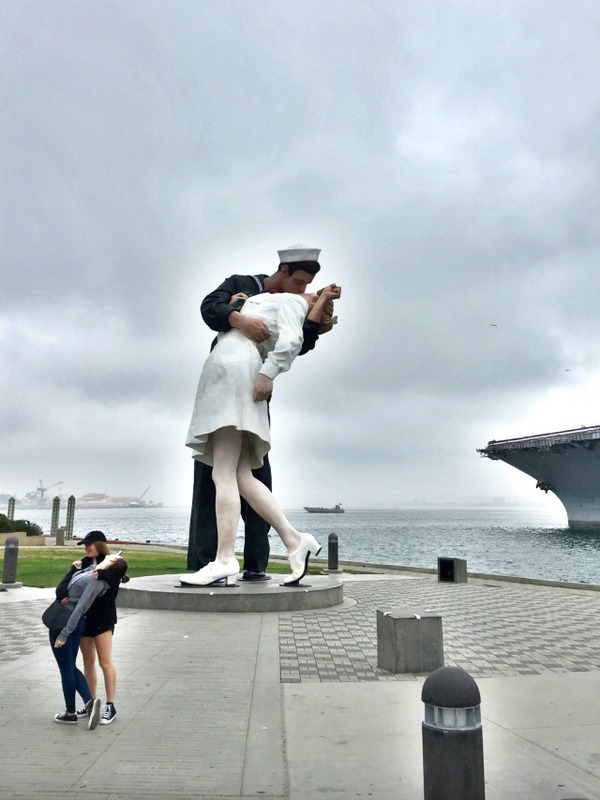 You can’t miss the Unconditional Surrender Statue, National Salute to Bob Hope and the Military, and the kids will love seeing ships in every direction! Seaport Village is located right on the bay in downtown San Diego. There are 17 unique eateries, tons of shopping, and a picturesque walking area complete with bridges, ducks, and fish. 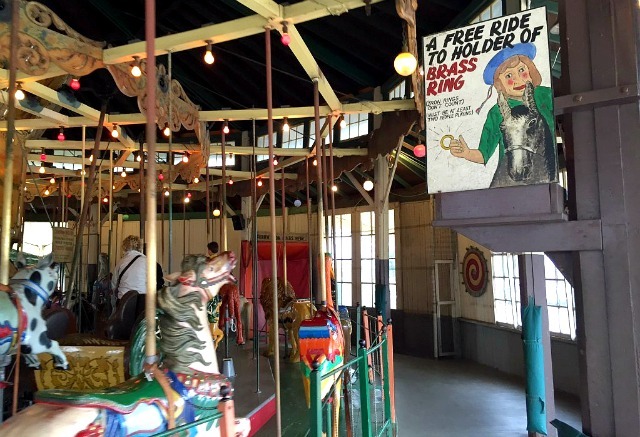 For $3 you can ride on the hand carved carousel from 1895. You will have to pay a small fee for parking. 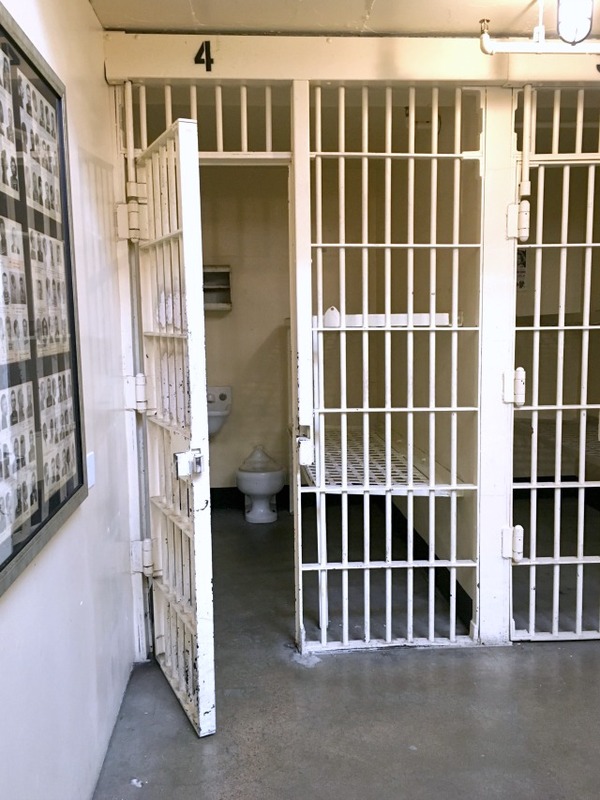 The jail cell exhibit is just a short walk from Seaport Village. This is totally free and a must see if you stop in Seaport Village. It’s located in a hallway right off the main courtyard in The Headquarters at Seaport. Insiders Tip: There is a free, very clean public bathroom right down the hall from the jail cell exhibit. Even the Starbucks around the corner does not have a public restroom. Entrance to the park costs $10 per vehicle, and it’s worth every penny. 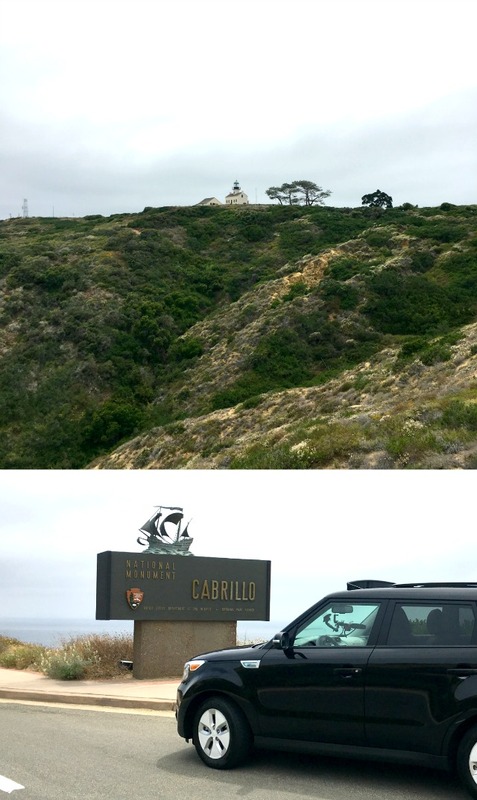 Cabrillo Park is the home of the Point Loma Lighthouse, trails, tide pools, whale watching, and amazing views of San Diego. Insider Tip: The best time to explore the tide pools is in the winter when the negative low tides occur during daylight hours. This 1,200 acre park is located in the heart of San Diego and is home to 17 museums, multiple gardens, and the San Diego Zoo. On the weekends, you’ll find clowns and street performers. The botanical building (closed on Thursdays) and the Timken Museum of Art always have free admission. For $2.50 a ticket you can take a 5 minute ride on the the historic carousel (more about the carousel and brass ring here) and the Balboa Park miniature train. Bonus: If you’re a resident of the county of San Diego or an active military personnel a list of rotating museums are free every Tuesday! The 100 acre zoo is located inside of Balboa Park. The zoo is home to more than 3,500 rare and endangered animals. Each year, from October 1–31, in honor of our Zoo’s founding, children ages 3–11 are admitted free to the Zoo and Safari Park when accompanied by an adult. Children under 3 enjoy free admission everyday. La Jolla Cove is tucked between 2 sandstone cliffs and is a great place to spend the day. 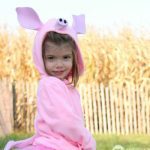 There is a large grassy area for playing complete with barbecue pits and picnic tables. On a good day, you can see 30 feet below the water in the cove! La Jolla Children’s Pool is just a short walk away and well known for snorkeling and sea lion and seal sightings. If you are in the market for scuba lessons you will want to check out La Jolla Shores. This splash pad is unreal and I’m a splash pad connoisseur! The splash pad is free and open from 11am-7pm every day of the week. The park also offers picnic areas, play areas, gardens, and public art. You can drive across the bridge or take the 15 minute ferry ride to Coronado Island for $4.75. 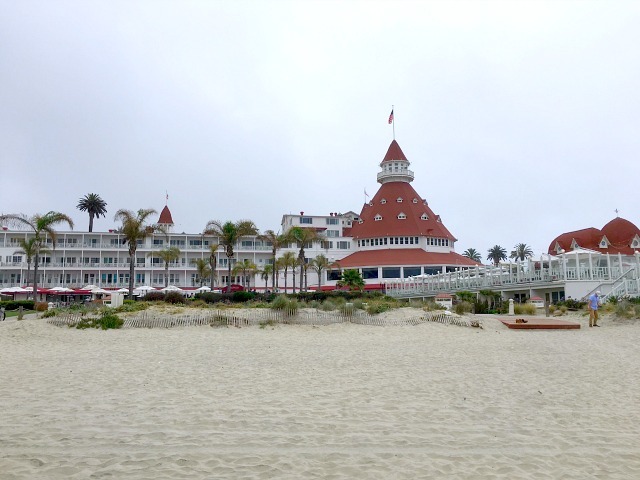 Built in 1888, Hotel del Coronado is a must see. Tour the the iconic building, go for an ocean swim, rent bikes, explore the tide pools, grab a vintage sweet treat at Spreckels and even hunt for ghosts! Insiders tip: You can bring y9our bikes on the ferry for no extra charge. Who can say they have explored a sunken ship? 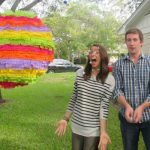 This is a must do in my book! According to Wikipedia, “The SS Monte Carlo was a concrete oil tanker launched in 1921 as the SS McKittrick but later became a gambling and prostitution ship in 1936.” As the story goes, the ship was anchored 3 miles out in international waters where gambling was legal. During a storm in 1937, the anchor came loose and the ship was grounded on land, but nobody wanted to claim the boat since gambling was illegal activity on land. 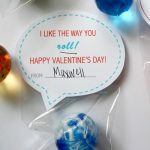 Rumor has it, there is buried treasure to be found! The sunken ship can be found on the beach in front of Coronado Shores Condominiums. 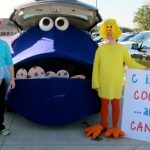 For more pictures and details about how to find the ship, check out this article from Local Adventurer. Coronado Island opens it’s 47th concert series in conjunction with the Coronado School of the Arts (CoSA). It’s a great opportunity to see the talent of the community’s youngest performers and enjoy orchestral, jazz and musical theatre numbers in Spreckels Park. Me and my really awesome Kia drive team (Shelley, Autumn, Paul) rocked out in our Kia Optima Hybrid and explored many of the spots in the list above. I’m no car expert, but after spending a few hours in the backseat of the Optima, I can vouch for the greatness of backseat air vents, a usb port for my charging up my phone in the backseat, and the awesome Harman Kardon sound system. 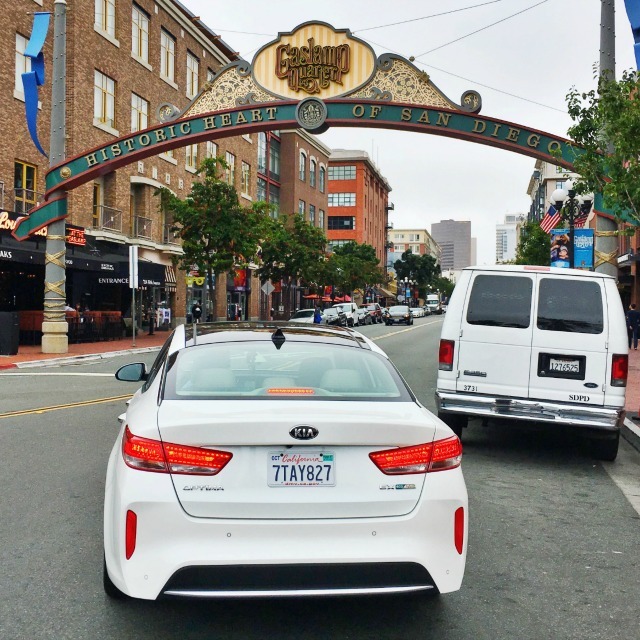 Thank you Kia and San Diego for allowing me to experience San Diego like a rock star! 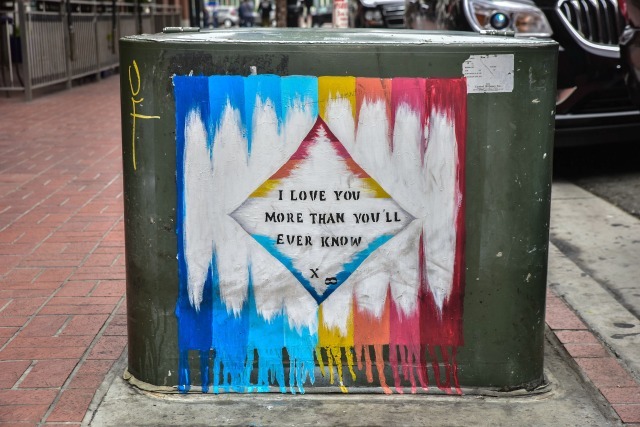 Psst… For 50 more city guides with lists of 10 fun, free family friendly things to do check out this page. Shelley! We definitely need a reunion trip! I love this. 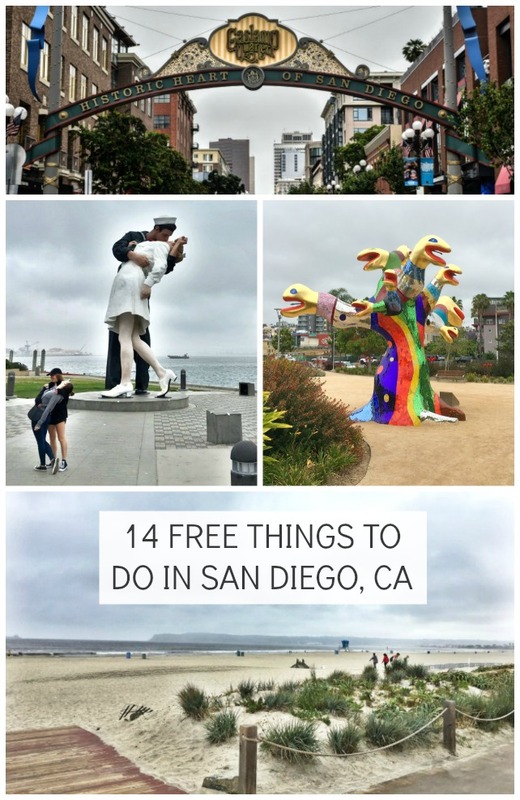 I will definitely visit San Diego and do these things! I can’t wait to visit.